How many of you out there think of him when I say “British art”? Or “shocking artwork”, for that matter? Is it his tiger shark? The butterflies that died for the sake of an expensive artwork? The diamond skull? 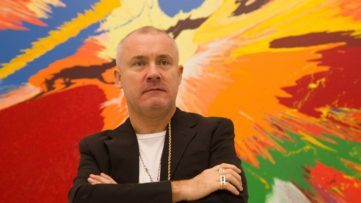 Whatever it is, there is no doubt that Damien Hirst represents one of the most important figures in his country’s history of contemporary art, and beyond. You can love him, you can think he’s overrated, or smug, or even the wrongful owner of his own pieces, but the fact of his immense relevance on the creative scene today remains, and all you can really do is look away. 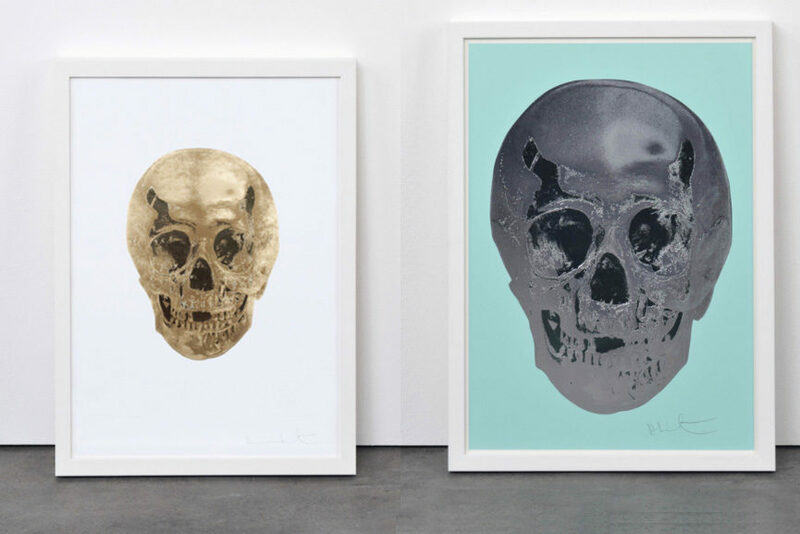 If, however, you admire Damien Hirst’s art, you’re familiar with his obsession with the topic of death and the many artistic projects he dedicated to it, in the course of an almost three decade long professional career. What is it that still makes Damien Hirst float on the surface of the art world sea, even when it seems inevitable that he will soon drown and disappear for good? The path to success, for Damien Steven Hirst, seems to have been filled with milestone events, each pushing him even further towards becoming an art superstar, curator, but also collector. He rose to fame in the late 1980s, when he organized Freeze, an exhibition of his and the works of his classmates at Goldsmiths College. Perhaps if Charles Saatchi hadn’t happen to be there at that very moment, we wouldn’t be talking about Damien Hirst at all right now, as this relationship helped build his career in a manner of a movie script. Hirst’s first major animal sculpture, A Thousand Years, came to be in 1990, and it featured flies and maggots inside a large glass structure, feasting on a rotting cow’s head. It was clear to everyone, and especially gallerists and collectors, that this artist was anything but ordinary, and that his intriguing art had great potential. Particularly fascinated by what he saw, Charles Saatchi did what any artist in the world dreams of – he offered to fund whatever work Damien Hirst wanted to make. This is where the aforementioned relationship between the two became crucial, resulting in the first exhibition of the Young British Artists movement in 1992, and no one can say that Damien Hirst did not respond gratefully to Saatchi’s generosity. The Physical Impossibility of Death in the Mind of Someone Living, a tank containing a tiger shark immersed with formaldehyde, wrote the pages of Contemporary art history and became iconic, if anything because it was groundbreaking and provocative almost on the level of one Fountain. 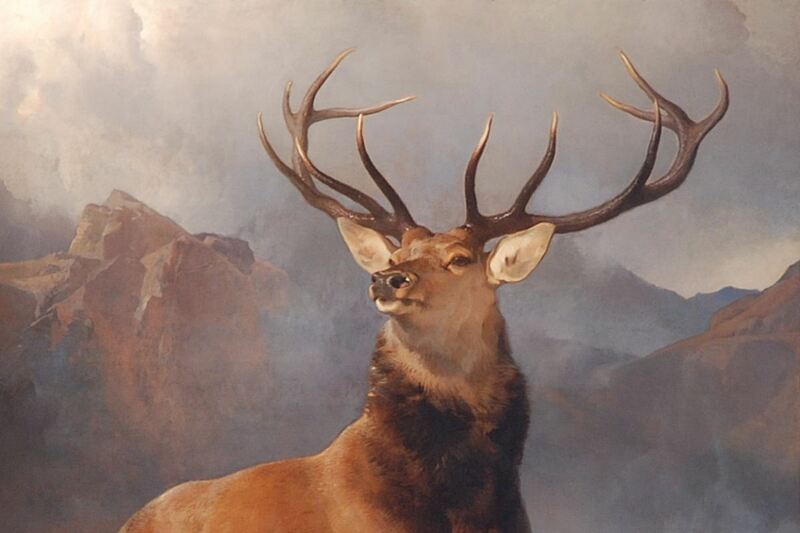 It shed a brand new light on the representation of visual arts, and it sold for £50,000. And then for $12 million. From then on, we witnessed things going uphill for Damien Hirst, from first serious presentation at the Venice Biennale, to his winning the Turner Prize in 1995 and the many exhibitions at renowned galleries and museums, but also numerous plagiarism accusations, and much more. The rather impressive art collection owned by Damien Hirst found its homes in two extravagant locations in London – one in form of a luxurious house, and the other at the artist’s newly opened Newport Street Gallery. From October 2015, the 37,000 square feet art space will showcase the works from Hirst’s collection, starting with noted Abstract artist John Hoyland, through April 3rd 2016. 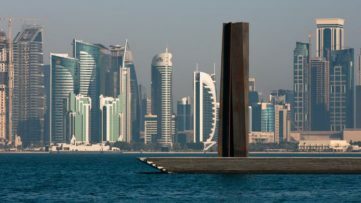 The creation of such exhibition platform reportedly costed £25 million, and it was entirely provided by Damien Hirst himself. When the 3,000 pieces aren’t on view, they will stay in a huge basement soon to be built under his £39.5 million property, which he only recently fought the planning committee about. Among the works, there are pieces by Banksy, Jeff Koons and Tracey Emin, to name just a few. 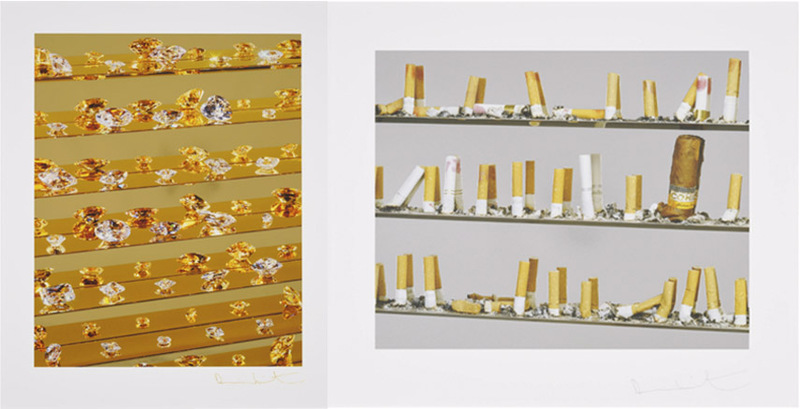 In 2008, Damien Hirst made yet another unprecedented move, by holding a two-day, one-man auction sale at Sotheby’s. It went.. well, certainly more than well: Beautiful Inside My Head Forever brought him a record £111 million for a total of 218 items offered, breaking the house’s record for a single artist sale. 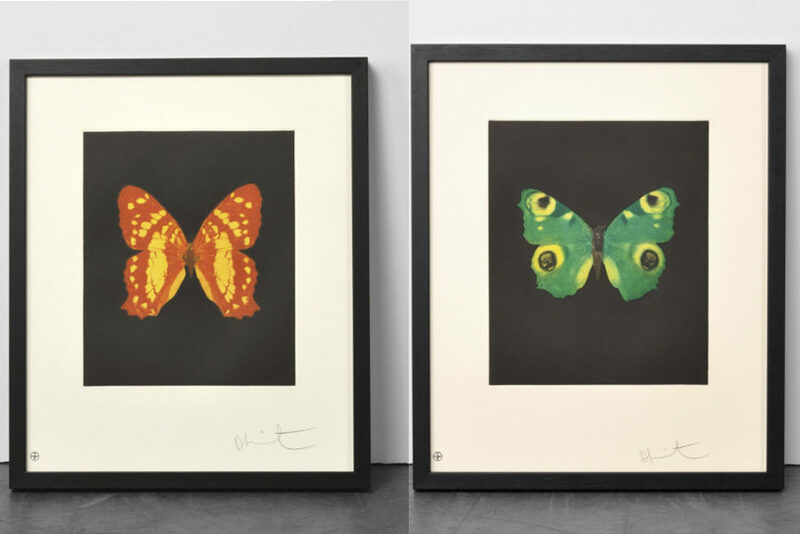 After a brief slow-down in sales, the art of Damien Hirst made a big comeback in 2013, confirming his strong status on the market as well as researchers’ predictions that his works will be re-valued, both as part of auction sales and in galleries. Among his most expensive artworks at auctions, there is the 2002 Lullaby Spring, which fetched $17 million at Sotheby’s in 2007. 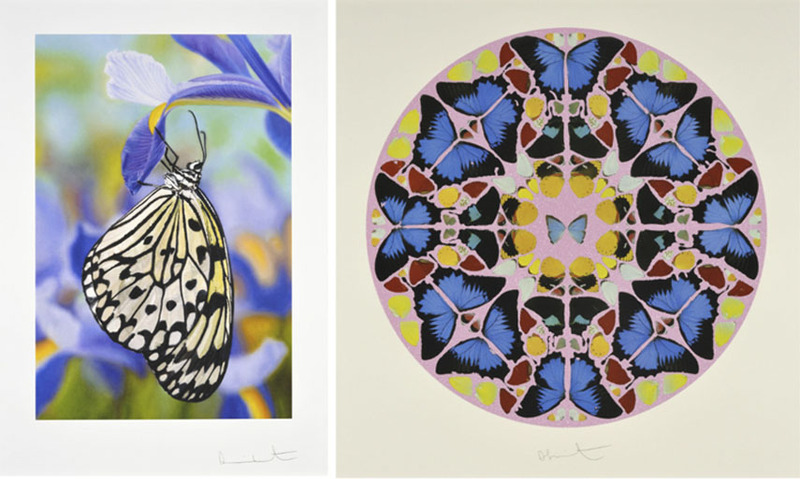 The experts remain confident about the commercial power of Damien Hirst’s works, which could also be supported by the popularity of the exhibition featuring them – for instance, his 2012 Tate Modern exhibition drew over 460,000 visitors. 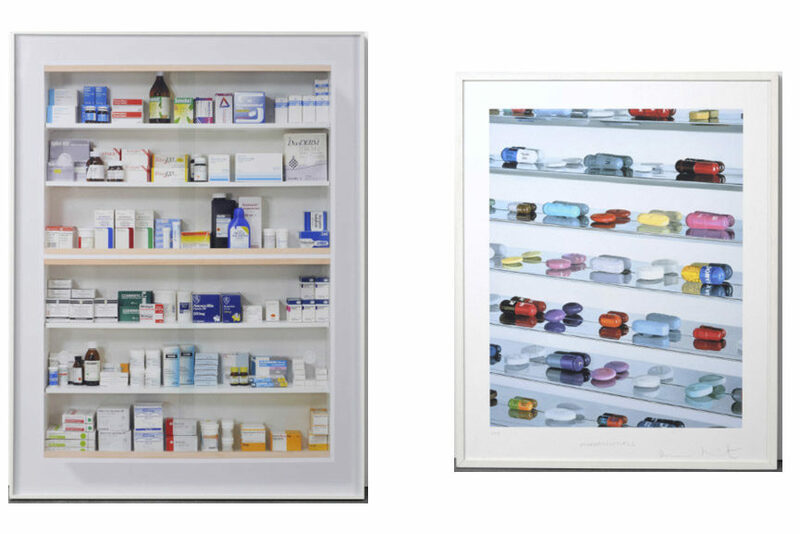 Certainly one of the most reliable art selling platforms where one can buy Damien Hirst artworks is Weng Contemporary, as they’re offering a curated selection from the artist’s most persistent, universal and recognizable bodies of work. 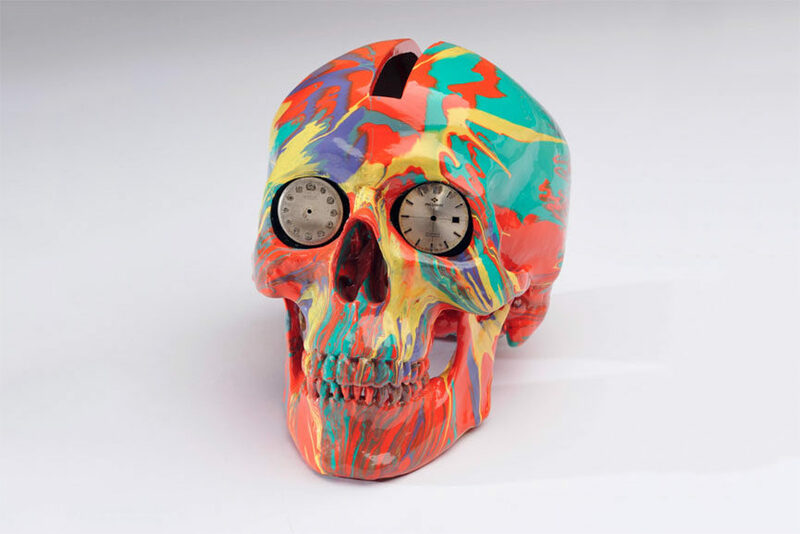 On sale, there are his trademark skulls, which redefined the notions of memento mori, playing with immortality by turning it into something glamorous, but also obvious. 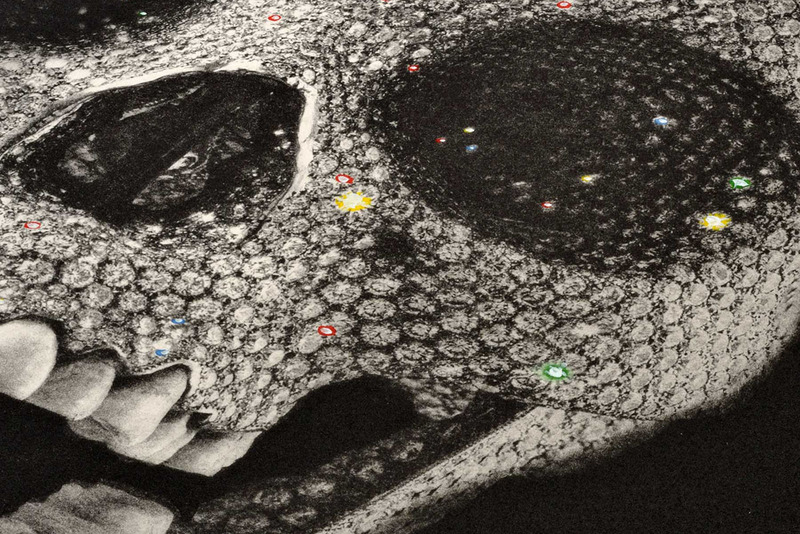 Among these, the silkscreen of his legendary diamond skull, entitled For the Love of God, world’s most expensive contemporary artwork; his Butterfly prints, as a symbol of beauty and fragility that questions the meaning of life and, of course, death; and finally, the artist’s Cabinets, as a shrine to modern pharmaceuticals that explores the equivocal role of medicine. Featured images in slider: The Hours Spin Skull, 2009. Gloss paint on plastic and CD, 19.0 x 12.5 x 19.5 cm (7.4 x 4.9 x 7.6 in). 210 unique works. 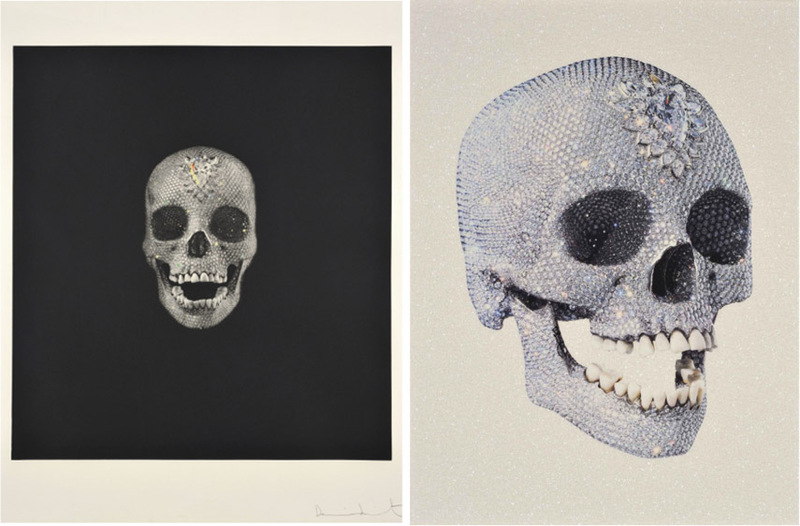 Price $7,500; Left: Death or Glory – Autumn Gold / Cool Gold Glorious Skull, 2011. Foil print, 72.0 x 51.0 cm (28.3 x 20.0 in). Edition of 2. Price $14,000 / Right: Till Death Do Us – Part Heavenly Peppermint Green, 2012. Silkscreen, 52.0 x 37.0 cm (19.6 x 14.5 in). Edition of 50. Price $5,000; Left: Emerge (Butterfly), 2009. Etching, 47.3 x 39.2 cm (47.3 x 15.4 in). Edition of 45. Price $4,000 / Right: Fate, 2009. Etching, 47.3 x 39.4 cm (18.6 x 15.5 in). Edition of 45. Price $4,000; Left: Godless, 2011. C-print, 160.0 x 121.9 cm (62.9 x 47.9 in). Edition of 25. Price $20,000 / Right: Pharmaceuticals, 2005. Inkjet print, 127.0 x 102.2 cm (50.0 x 40.0 in). Edition of 75. Price $32,000. All images courtesy of Weng Contemporary.